The Woodstock icon and social activist clown brings some friends and some instruments to The Marsh Berkeley. Wavy Gravy — clown, peacenik, hippie emeritus — is moonlighting at The Marsh Berkeley this month and demonstrating that, while his discontinued ice cream flavor no longer gets a lickin,' the 76-year-old continues to keep ticking. This Thursday through Sunday, Wavy Gravy is spontaneously spinning yarns and spilling beans in a ninety-minute performance that may well last two hours (last weekend's did). Gravy, born Hugh Romney, has had many claims to fame, most memorably as the emcee of Woodstock and captain of its Peace force. He was also the official clown of The Grateful Dead and the founder of Camp Winnarainbow. And, like Ram Dass (whose life was portrayed in Acid Trip, which opened at The Marsh last month), Gravy was always in the midst of what was happening when the times were a changin'. Gravy told me that he used to do stand-up comedy but "now I have an Insanity Clause in my contract with The Marsh that allows me to sit down and spin stories of my life and times, and even pluck a few tunes on the iktar. My entire life and times are on display." The mostly spontaneous performance of Wavy Gravy and His Guided Mistletoes may be surprise appearances from "special friends." "You never know who might come by. The ever-brilliant Mr. YooWho was a real sweet treat the other night," he said, referring to Moshe Cohen, a mime, musician, and Marsh favorite. 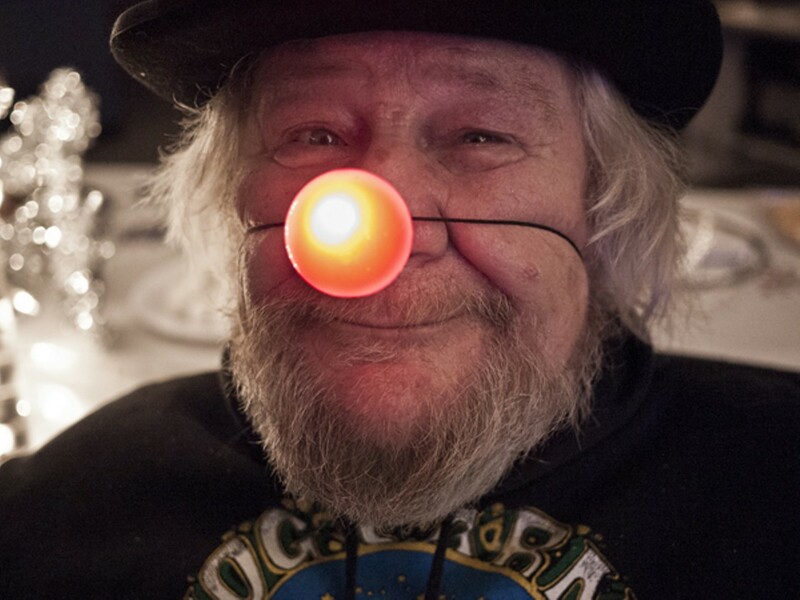 Wavy Gravy said Claus Reindeer, his Santa-costumed alter ego, will also make an appearance. As Claus Reindeer, Gravy was arrested a number of years ago at a death penalty protest at San Quentin State Prison for attempting to give Governor Arnold Schwarzenegger a Life Saver. Wavy Gravy started his clown vocation when he was asked to cheer up some sick kids at Oakland Children's Hospital. Then he realized he was less likely to be arrested at protests if he was dressed as clown. In 2010, filmmaker Michelle Esrick made the documentary Saint Misbehavin': The Wavy Gravy Movie. Esrick said she wanted audiences to see Gravy "as a politically active figure who has dedicated his life to helping the underprivileged." The Ben & Jerry's flavor Wavy Gravy (chocolate fudge hazelnut swirl with roasted almonds and a Brazil-nut, cashew base) was retired in 2003 by Unilever, the Dutch corporation that bought the ice cream company. Gravy said he was "dumped for not being cost-effective." The royalties Wavy received from the sales of the ice cream went to help fund scholarships for homeless and underprivileged children to attend Camp Winnarainbow, and proceeds from his Marsh show will also benefit the camp and his Seva Foundation. At the Marsh show, Wavy Gravy will no doubt drop names and tell stories about friends dropping acid, but when I asked him what he was most proud of, he told me about the camp. "My greatest legacy," he said, "are the children of camp Winnarainbow — 700 a summer for nearly 35 years. They give me nostalgia for the future."